Starters: D Boyd, B Morris, M Gasnier, M Cooper, J Nightingale, J Soward, B Hornby (c), N Costigan, D Young, M Weyman, B Scott, B Creagh, J Smith. Bench: N Fien, T Merrin, M Prior, J Saffy, N Emmett, K Stanley, J Green, L Priddis (four to be omitted). Starters: A Minichiello, J Leilua, K Linnett, S Kenny-Dowall, S Perrett, T Carney, M Pearce, J Ryles, J Friend, F-P Nu'uausala, N Myles, M Aubusson, B Anasta (c). Bench: M Kennedy, J Waerea-Hargreaves, D Conn, J Aubusson, N Kouparitsas, T Symonds, L Paea, P Graham (four to be omitted). Sunday 3/10 @ ANZ Stadium. Referees: Tony Archer & Shayne Hayne. Video Referee: Bill Harrigan. Touch Judges: Paul Holland & Jeff Younis. |=| Don't miss the NRL Tweet Player of the Year Awards - they were Announced 6pm Tuesday September 7th! |=| Get the Grand Final NOT The Footy Show Podcast! Who Plays Who In Week Four of the 2010 NRL Finals? On Sunday Afternoon October 3 - ANZ Stadium will host the 2010 Grand Final. The Dragons crushed Manly in Week 1 with an emphatic 28-0 scoreline to get a week off, then edged out the Wests Tigers 13-12 in an epic Preliminary Final. While the Roosters have been busier - they came back from the dead to beat the Tigers 19-15 in extra time in Week 1, over-ran the Panthers 34-12 in Week 2 and crushed the Titans in the 2nd half en route to a 32-6 win to get into the Grand Final. The Titans had a week off after the opening night of the Finals when they beat the Warriors 28-16, but despite having a home Preliminary Final were overrun 32-6 by the Roosters to end their season. While the Tigers had to recover from a 19-15 extra-time loss to the Roosters in Week 1, travel to Canberra to beat the Raiders 26-24 in Week 2 but were beaten 13-12 by the Dragons in the 2nd Preliminary Final. Canberra stormed home with 9 wins in 10 games (including 6 straight) before losing their home semi final with the Tigers. The Raiders missed a golden opportunity to win a competition when they didn't really have a great season but were beaten by a better team... and even if they had snuck through the season ending knee injury to Terry Campese killed that dream with 24 minutes left. The Panthers went from equal title favourites with the Dragons about 6 weeks before the Finals to also-rans after injury and poor form ruined their end of season push. Losing key players to injury in the 1st & 2nd week of the Finals saw them go 0-2 at the most important time of the year. One team had a year that exceeded expectations, the other struggled to live up to their premiership contenders tag... in the end neither could muster a victory when it really mattered. The NRL Tweet's Previews for Week Four. For More of this Article click the link below... Team News & Our Predictions. And then there were two... after one good and one great Preliminary Final - last year's Wooden Spooners will meet the back-to-back Minor Premiers in the 2010 NRL Grand Final at ANZ Stadium next Sunday at 5pm. In Brisbane, the Titans have blown another opportunity in September after failing to back their talent against a Roosters side that did just that - the final scoreline of 32-6 was not so much an indication of the difference in talent between the two teams, rather the USE of the talent on offer. In the end the team that was willing to play football above percentages - the Roosters - emerged with a comprehensive 32-6 win. The Roosters have the best playmaking trio in the competition in Todd Carney, Braith Anasta & Mitchell Pearce and Coach Brian Smith is letting them play like few coaches in the NRL are willing to do. In Sydney 71,000 fans witnessed a great semi final with the Dragons getting back into a Grand Final for the first time since 1999 with a 13-12 victory over the Wests Tigers. Sadly there was one non-call by the officials that will haunt the Tigers this off-season when St.George-Illawarra forward Jeremy Smith led with his knees attempting to 'tackle' Lote Tuqiri... this left the Tigers winger in serious pain and despite numerous replays showing conclusive evidence that Smith had made no attempt to tackle Tuqiri with anything other than his cocked knees... the officials failed to act when the importance of the game demanded that they show some backbone. They didn't and from the next play Benji Marshall (who may have been taking a shot at penalty goal from 40m out) hoofed his clearing kick out on the full and from the next set Jamie Soward fired the Dragons into the Grand Final with a quality field goal from 35m out. What made the call so crucial was the fact that the non-call with 8 minutes left essentially ended the Tigers chances of scoring again before the end of regulation but more importantly - offered the Dragons their first chance at a field goal - which Soward was good enough to take. Make no mistake - this is not a suggestion that the Dragons didn't deserve to win the game or that they wouldn't have won the game anyway - but the non-call definitely denied the Tigers their chance at winning the game. So next Sunday - the Roosters who have played the best pure football this year (yes better than the Tigers) will take on the Dragons - a team who deny the opposition that chance of playing football better than anyone else - in the 2010 Decider. Who do you like for the Premiership? |=| Get the NOT The Footy Show Podcast! Our Grand Final Show is going to be HUGE! We have Superstar Johnathan Thurston on the show! Waz will be joined by Dave, Matt & Nic plus a few extra guests on our Grand Final Show - out Friday October 1. |=| Episode 44 has Waz & Dave in the studio previewing the second last weekend of the 2010 NRL Premiership. First the Gold Coast Titans take on the Sydney Roosters and then the St.George-Illawarra Dragons face the Wests Tigers in the Preliminary Finals. |=| Matt Duncan joins us once again from Queensland to report a South Queensland Crushers jersey sighting, recap the QLD Cup Grand Final entertainment and discuss which teams are under the most pressure heading into the Preliminary Finals. |=| Nic McInerney is MIA despite being booked in for a chat... and has subsequently been punted from the GF Show in a shocking axing at the selection table... actually he'll be in Tasmania but this sounds better. |=| We also look at Crowds at the Elimination Finals and recap the Tigers v Raiders & Roosters v Panthers. And Dave gets a look at the exclusive footage of Albert Fulivai getting run down by Paul Harragon in 1994 - that Waz mentioned last week. The winners play in the NRL Grand Final Next Sunday. Make sure you subscribe via the iTunes Page HERE or you can subscribe to us on through the iTunes function - just enter http://notthefootyshowblog.blogspot.com/feeds/posts/default?max-results=500 into the 'subscribe to podcast' option and you're away. 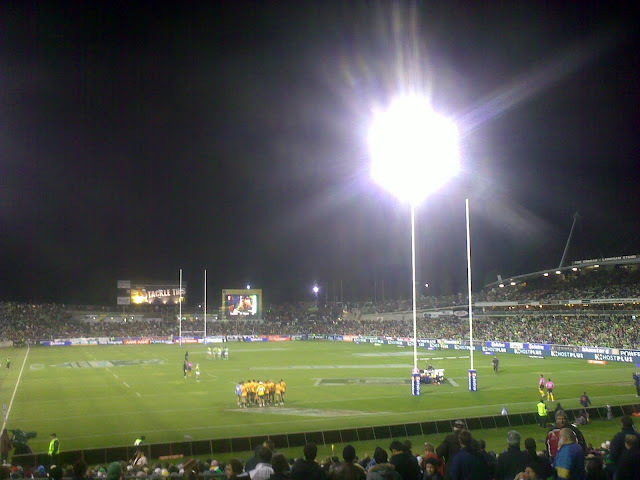 Semi Final from Canberra Stadium, 17 September 2010. Here is Episode 43 of NOT The Footy Show - Road Trip Special!